Difference between revisions of "Adena Mound"
| caption = This wonderful carved pipe was found in the Adena mound in Chillicothe. 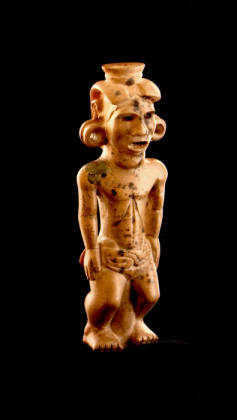 It depicts what archaeologists think to be an Adena man wearing typical clothing and jewelry. #CERHAS. <em>EarthWorks, Virtual Explorations of the Ancient Ohio Valley</em>. The Center for the Electronic Reconstruction of Historical and Archaeological Sites (CERHAS). Cincinnati, OH, 2006. #Lepper, Bradley T. "The Adena Pipe: icon of ancient Ohio." ''Timeline'' Volume 27. Number 1, pages 2-15. 2010. #Mills, William C. &quot;Excavations of the Adena Mound,&quot; <em>Ohio Archaeological and Historical Publications</em>, Volume 10, pp. 452-479, 1902. #Pangea Productions. <em>Searching for the Great Hopewell Road</em>. N.p. : Pangea Productions, 1998.